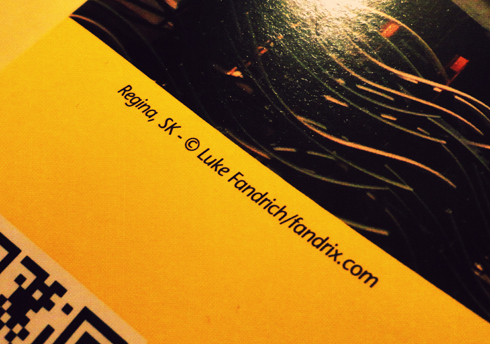 The new city of Regina phone book is out, and naturally the most thrilling part for me has been finally getting to see the image I sold printed on the cover. In addition, my name and portfolio web address are credited on the cover too just below the picture. I wrote about how this all came about last year if you're interested in the back story. 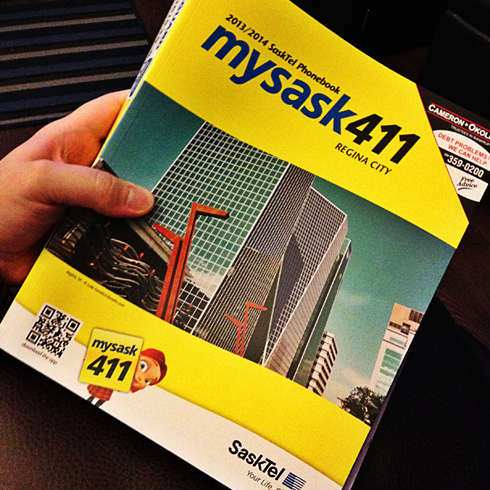 What's especially cool is that after a trip to Regina this past weekend, the phone book had literally just been delivered to my friend's doorstep when I arrived. I was sure to take one as a souvenir. Over 200,000 phone books have been printed, and I love the fact that from the university to the Legislative Building to the front desk of Hotel Saskatchewan, I've got one of my shots distributed across Regina for the next year. It's one more really cool achievement in a year that's been full of amazing media projects and professional firsts. Plus, it's a fun story to tell and a pretty unique way of feeling connected to the place I used to live. That timing was indeed pretty crazy. Could not have been more perfect!